24/30 City/Highway MPG Headquarter Mazda may be a brand-new dealership, but we come from a proven, family-friendly dealership background. We look forward to meeting you, showing you our inventory, and helping you drive off with a car you’ll love! 25/31 City/Highway MPG Headquarter Mazda may be a brand-new dealership, but we come from a proven, family-friendly dealership background. We look forward to meeting you, showing you our inventory, and helping you drive off with a car you’ll love! 22/27 City/Highway MPG Headquarter Mazda may be a brand-new dealership, but we come from a proven, family-friendly dealership background. We look forward to meeting you, showing you our inventory, and helping you drive off with a car you’ll love! The New Mazda CX-5 has a maximum cargo capacity of 71.2 cubic feet, and can tow up to 2,000 pounds through Leesburg. A New Mazda CX-5 makes every journey more exciting than the last. Compare the CX-5 vs CX-3 to find the best Mazda SUV for you. 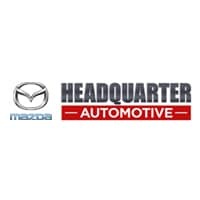 Contact our Mazda dealership to schedule a test drive with one or all of the above models at Headquarter Mazda, located near Orlando and Kissimmee. Before you schedule, take a moment to browse our current offers and incentives!